Before you do anything, make sure your car is up to the task of strenuous driving. Check your tyre wear and their pressures as well as the brake pads and fluids. Ensure the car is empty of all unnecessary items and everything else is secured. Also have a quick walk around your car looking for anything obvious before getting into your car and driving to the starting area. Things like an unlatched bonnet can be a scary and expensive surprise if it wraps itself around your windscreen when driving fast on the track. Or seizing your engine because there was insufficient engine oil for hard driving. Set the base position of your seat first. If your seat height is adjustable, set it to the lowest position. This low driving position helps keep your vision up and improves the handling of the car. Slide your seat forward until you can put your foot flat on the firewall underneath the brake pedal. When you fully depress the brake pedal, you will still have some bend left in your leg, without undo pressure between your leg and the seat. Your seat back should be in a relatively upright position. Stretch out your arm straight while your shoulders are touching the seat, and adjust the seat back so that your wrist is on the top of the steering wheel. If your steering wheel angle is adjustable, set it so that your instruments are clearly visible without tilting your head. Setting the wheel as high as it can go will assist in keeping your vision up and forward, which is critical to good track craft. If you have a road going car, it is unlikely you have a racing seat and racing harness. However, for most drivers, being secure and centred in your seat whilst you are cornering helps with car control. If your seat is not at the back of its travel, the easiest way to ensure a secure seating position is to slide your seat to its rear most position, push yourself into the back of the seat and remove as much slack from your seat belt, feeding the excess back into the seat belt retractor. Then sharply pull the seat belt away from your chest to engage the inertial lock, move your chest forward to hold the belt in the locked position, and slide your seat forward to your normal driving position whilst keeping the seatbelt in the locked position. This action should have your seat belt as tight as possible and you being securely held in position and able to better concentrate on steering your car rather than attempting to keep centred in your seat. This may take a few attempts to master, but the additional control, for most, is worth it. Place your hands at the 3 and 9 o'clock positions on the steering wheel. When you're on the track, never shuffle or slide the steering wheel through your fingers and never cross your hands over each other. This way you'll always know exactly how to get your car pointed straight again. Everyone has experienced what it's like to forget exactly which way your tyres are pointed, especially when manoeuvring around a parking lot. A harmless error, it’s easily corrected at low speeds. At 100km/hr, that half-second can be bad news. Keeping your hands at 3 and 9 will also prevent you from using too much steering input. Your car's steering system was designed for low speed manoeuvring on the street, but when you're on a track, small inputs go a long way. Generally if you're using more than a half lock of steering you're either oversteering or understeering which is the fastest way to slow lap times. Finally, it's time to talk about driving. And here the key is to follow what’s known as a driving or racing line. It’s the fastest path around a track and it’s often not what you think. On most tracks at the end of fast sections or straights, there will be braking distance markers. Which marker you use for initial brake application is dependent on many factors such as vehicle speed, vehicle weight, driver skill etc. Effective braking is a learned skill, as your skill improves your braking will adapt. The MX-5 Club of NSW generally sets a cone on the inside of a corner at the recommended corner apex, marking the innermost point of the corner and generally the aiming point for maintaining best track speed. Many corners on a track are late apex corners. If you look at a conventional U-shaped turn, it’s easy to see where the middle of the corner is, but that is not the recommended apex. The apex is further on and will allow your car to take a larger arc and carry more speed. Knowing a corner has a late apex and having the patience to wait for it are two different skills. The diagram below is a good example of a hairpin corner such as Turn 10 at Wakefield Park. 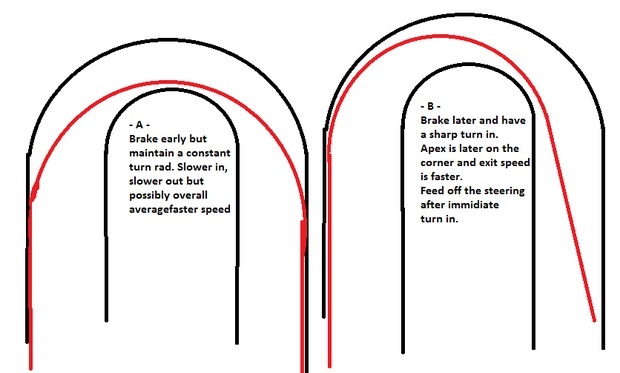 Most drivers would tend to approach the corner in a symmetrical style like the first picture, however, to maximise exit speed and the quickest speed down the main straight, the second diagram is a more effective approach. While it’s a good idea to stay away from big bulging curbs as they can upset the car or push you off line, don't shy away from smaller curbs, rumble strips or those painted stripes. Start your turn-in from the outer edge of the track, hug those apexes tight, and run to the outer edge of the track for the corner exit. Even a few centimetres can add up to tenths of a second each lap. By using all the track available, you will maximise the turn radius which means you are maximising the speed you can carry through the corner. The next part is critical: vision. The farther ahead you’re looking, the more time you have to react to what's coming next. When you're approaching a corner, glance ahead to the following corner to ensure the track is clear and no-one has spun their car. When you're headed into a corner, you should already be looking at the corner exit, not at the apex cone. It’s easy to fixate on what's immediately in front of you, but that won’t give you enough time to react properly. If you want to go somewhere, look there. Likewise, if you want to avoid something, don't look at it. Whether you're aware of it or not, your hands have a tendency to follow your eyes. Now let's talk about slowing down. Heading into a braking zone, it's important to apply your brakes smoothly and firmly early on and ease up after. A common mistake is braking too hard too late. This can be especially problematic for cars without ABS, as locking the brakes is a fast way to ruining a set of tyres. Lifting off the brake quickly causes the front suspension to spring up, which reduces load on the front tyres, reducing grip and creating understeer. With the car not headed in its desired direction, most novice drivers will then try and add too much throttle or too much steering, which just makes things worse. Once you've slowed down for a corner, smoothly turned in and nailed the apex it's time to accelerate again. At this point don't just hammer down on the gas as soon as you can. You smoothly apply the throttle as you open up the steering, otherwise you'll ask too much of the tyres and get wheel spin or worse. Think of the steering wheel and throttle as being connected. As you turn the wheel back to centre, the pedal should go down. Turned steering means no throttle, and straight steering means maximum throttle, and there should be a smooth transition between them. Corner exit is critical. Any speed you gain at the start of a straightaway will be amplified at the end of it. So, the most important corners are the ones before the longest straights. Slow in, fast out tends to be fastest. Finally, you need to learn the feel of your trusty steed. First time track drivers often start below the level of grip and then drive overly aggressively, past the point of grip, then slow down and do it all over again. Driving fast on a racetrack is essentially being able to feel the edge of the grip and stay on it for as long as possible, which takes practice. You've got to learn to feel what your car is telling you, sensing the grip of the tyres through the steering wheel and the seat. Track days are a lot of fun, but there are two enemies when it comes to going fast on a racing circuit: emotion and exhaustion. Both apply to you and the latter to your car. Don't do too many consecutive laps or you'll ruin your tyres and overheat your brake pads - something you'll know because the brake pedal will start to feel spongy and your braking distances will get a lot longer, as will your lap times. Remember to run a cool down lap and never apply your parking brake on red hot brake rotors. When parking your car in the pits, switch your car off, leave it in gear and leave the handbrake off. This prevents you welding your rear brake pads to the discs or warping your brake rotors. If you take the time to learn and practice, it’s not hard to chase down some significantly more powerful cars. The last two skills to master to become a complete driver are trail braking and the heel & toe downshift. It's important to note that you DO NOT have to do all your braking in a straight line. Trail braking is the method of slowly releasing the brake after you turn-in for a corner. This is less about slowing the car and more about ensuring a smooth transfer of weight and maximising the front tyre grip. 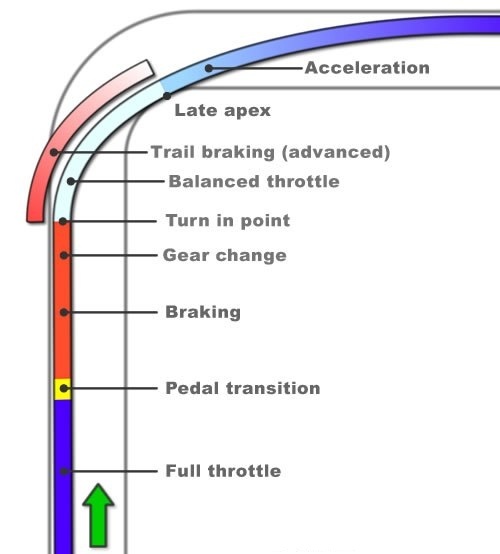 A good way to understand trail braking is to study a G-plot of the longitudinal acceleration (braking/acceleration) versus lateral acceleration (turning left and right). An understanding of vector forces helps too! Without the benefit of aerodynamic downforce, the grip available to a car and it's tyres is limited to a certain level of acceleration either forwards, sideways or a combination of both. In the example shown below, the limit of maximum grip is shown as 1G ie. one gravity of force (9.8m/s2). 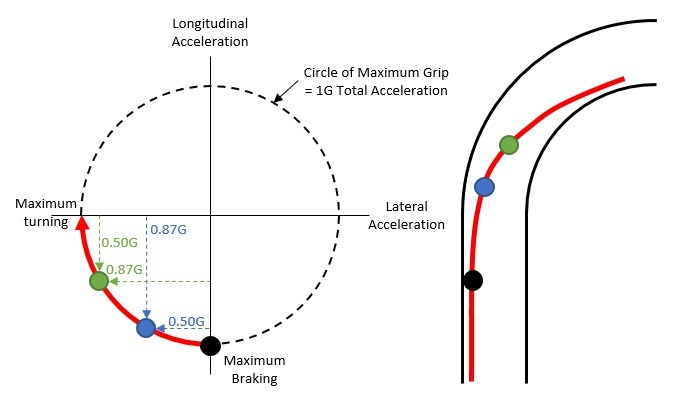 Under braking, the longitudinal force reaches the maximum of 1G, and when fully loaded in the corner the lateral force reaches the maximum of 1G. Trail braking is when you transition smoothly between these two states, with the total G force moving smoothly around the 1G radius of the curve. This is achieved by gradually easing off the brake as you turn the car into the corner. For example, the blue dot corresponds to 0.87G braking and 0.50G lateral. As the longitudinal force reduces (easing off the brake), the lateral force can increase and apply more load onto the outside tyres, while the total force is maximised at 1G, the limit of grip. For example, the green dot corresponds to 0.50G braking and 0.87G lateral. Don't freak out if you can't get this right away; it takes practice. Drivers use the heel & toe method to smoothly combine braking and downshifting as they approach a corner. Good drivers know that blipping the throttle between gears in a downshift to speed up the engine to match the tyre speed avoids compression locking which will cause the back end to wobble around. Heel & toe downshift simply combines blipping the throttle with braking. On modern cars, the driver uses the right edge of his right foot (or heel) to blip the throttle while simultaneously using the left side (or ball) of the same foot to firmly depress the brake pedal. Done correctly, your foot pivots quickly on its ball, and it is helpful if you move your right knee towards the right. Master trail braking, the heel & toe downshift and all the skills listed above and you are ready to set some great lap times. So, to summarise, using the above diagram. As you approach the corner at full throttle, you smoothly squeeze on the brake with increasing pressure (rather than stomping it), and apply as much brake pressure as is required to decelerate the car appropriately. Whilst braking, downshift a gear (or multiple gears in one single change) using heel & toe to rev match your engine to your wheel speed. At the turn in point, feed in the steering smoothly and use trail braking to transition smoothly from full braking to full turning. Aim for a late apex to maximise exit speed and smoothly apply more throttle reaching maximum as the steering straightens.